Prepping for his three cases before the U.S. Supreme Court, former Washington Attorney General Rob McKenna always zeroed in on the court’s perceived swing vote. “We would always practice potential questions, and we focused on Justice Kennedy,” McKenna said. Twice, the preparations paid off. But on a Monday morning in October 2007, McKenna and Secretary of State Sam Reed found themselves on the wrong side of a coalition of Justice Anthony Kennedy and famously boisterous Justice Antonin Scalia. They were arguing that Washington should be allowed to hold primary elections that advanced the top two candidates, regardless of party, and it was clear the Ronald Reagan nominee wasn’t buying their pitch. “When he was through, I thought, ‘Man, we’re toast,’ ” said Reed, who went with McKenna on two of his trips to Capitol Hill. Kennedy did vote against the state, joining Scalia in a dissent that said Washington’s system unconstitutionally damaged the role of political parties in selecting candidates. The pair found six allies on the panel, and the state’s primaries remain a top-two affair. 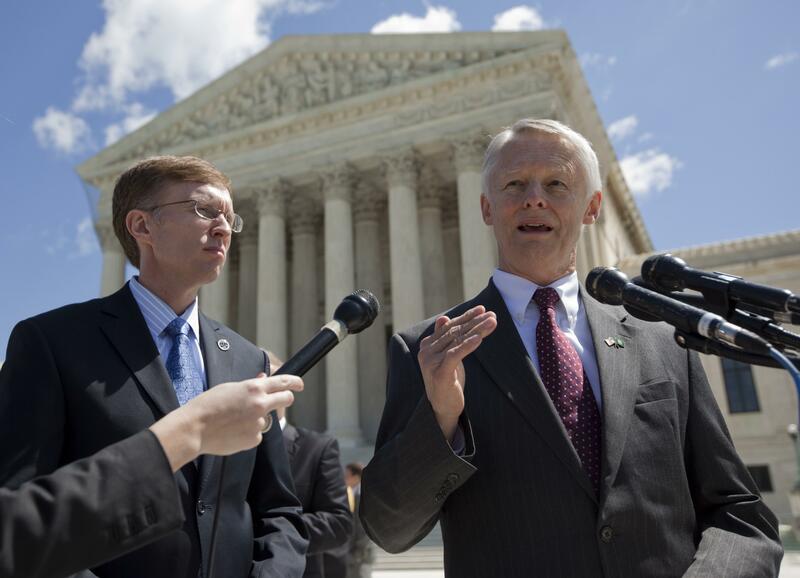 Despite that difference of opinion, Reed, McKenna and other local lawyers who’ve appeared before the nation’s highest court said Kennedy’s announced retirement Wednesday means the panel will lose one of its most thoughtful judges and the link between two ideological factions on the bench. That position often drew the attention of attorneys arguing before the court, just like McKenna practicing his answers in mock cases to a theoretical Justice Kennedy, said Jacob Rooksby, dean of Gonzaga University’s School of Law. McKenna said in his three times appearing before Justice Kennedy, he appreciated the straightforward questions the judge would ask. In oral arguments, some justices – Scalia notoriously so – would use attorneys to set up arguments with other judges on the panel, McKenna said. Kennedy wasn’t like that. That included rulings in McKenna’s favor on a case involving public disclosure of names on a petition seeking to change the state’s laws on gay marriage and a unanimous victory upholding a Washington state law that requires public-sector unions to obtain permission for using certain fees for political purposes. Washington’s Democratic delegation in the U.S. Senate raised concerns, as did other Democratic groups, on Wednesday that the loss of Kennedy and President Donald Trump’s pledge to immediately begin a search for his successor indicated the Supreme Court would tilt toward hard-line conservatism. “I share the deep concern of so many families across this country who are already suffering under the Trump administration and fear further erosion of the progress in this country,” said Sen. Patty Murray in a speech on the Senate floor Wednesday. She urged the GOP to wait until after the midterms to fill Kennedy’s seat, calling out her Republican colleagues, including Majority Leader Sen. Mitch McConnell, who delayed a vote on former President Barack Obama’s pick for the court in the months leading up to the 2016 presidential election. Sen. Maria Cantwell also called for “a thorough and deliberative vetting process” before replacing Kennedy. Any pick would only need a simple majority of votes in the U.S. Senate, following a changing of the rules by GOP leadership that paved the way to Justice Neil Gorsuch’s appointment last year. Jim McDevitt, a former U.S. attorney for Eastern Washington appointed by President George W. Bush, said concerns about hyperpartisanship among those in the running for seats on the nation’s highest court were overblown. “You don’t get that high up in the judiciary, in the legal field, by being so partisan that your partisan leanings cover everything you do,” McDevitt said. But McKenna, who was elected twice as the state’s attorney general as a member of the Republican Party, acknowledged that the GOP had an opportunity to shape the judiciary for years with their pick. “God bless him for deciding to retire now, to give the administration and the Senate a chance to pick another conservative,” McKenna said. Rooksby, of Gonzaga University, said vetting for political ideology and “grooming” candidates for the Supreme Court is likely here to stay. The age of justices like Kennedy and previous swing voter Justice Sandra Day O’Connor, who had political views but who weren’t vocal about them prior to selection to the court, is likely over, he said. “The folks that are going to be considered, you’re talking of a certain pedigree, a certain background, and then documented opinions as judges on certain issues,” he said. It’s also unlikely the political battle for control of the court is going to change. “Unfortunately, I think it’s going to be rancorous,” Rooksby said.